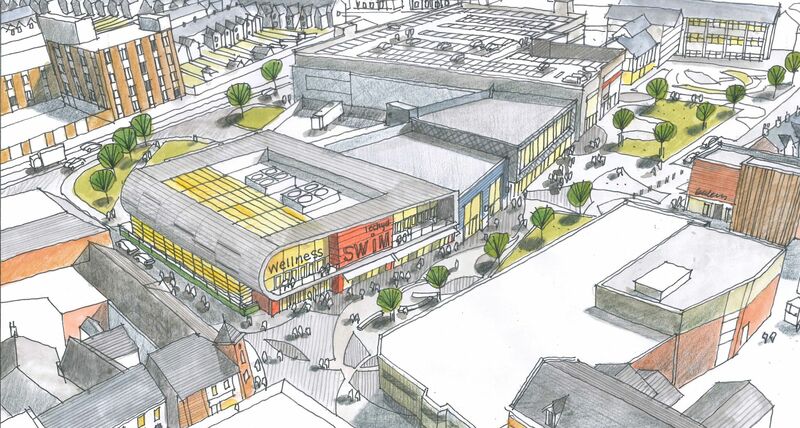 Neath is set to benefit from a brand new leisure centre, providing modern facilities and boosting footfall in the town. At a meeting of the Regeneration and Sustainable Development Cabinet Board today (12th April) Councillors approved a proposal to amend the existing Neath Town Centre Redevelopment plans for the former Wilko and Tesco Metro site in Water Street to include a new leisure centre, replacing the current one at Dyfed Road, in addition to retaining six of the original eight new retail units already agreed for that location. The future of town centres depends on having a diverse offer including shopping, leisure and culture, and development plans need to adapt to changing market situations and customer preferences. Looking at the national picture and the future of retail and high streets, the aim is to increase footfall into towns to provide an attractive proposition for new businesses and retailers. Whilst the main element of the plans for the town centre is the retail offer, the scheme is flexible to allow for changing trends and to take advantage of other opportunities that may arise. Cllr. Rob Jones, Leader of Neath Port Talbot Council said: “We want to maintain a leisure offer in the town and we want to make sure that people in Neath have access to modern facilities and activities to improve their health and wellbeing. Dyfed Road Leisure Centre is now over 50 years old and requires significant maintenance investment in the next few years just to keep it open. The original mechanical and electrical services need to be replaced and extensive repairs are required to the roof and external fabric. The maintenance work is estimated to cost in excess of £1m and would require the facility to close for up to 12 months. The Council believes that investing in a new facility, rather than facing increasing maintenance costs for an ageing building, will be better value for money. To maintain a leisure offer in Neath the total number of retail units will be reduced from eight to six and a new leisure facility will be built as part of the new development. It will include a 25m, 6 lane pool and learner pool, improved gym and multi- purpose areas for different leisure offers and classes. New squash courts will be provided at Cwrt Herbert Leisure Centre alongside the existing dry-side facilities. This means that half the space within the scheme will be occupied upon completion, improving footfall and providing an immediate boost to the town. This will benefit existing retailers and also offer an attractive proposition to attract new retailers and businesses into the town centre. The scheme will now be redesigned to incorporate the leisure centre, with construction starting on site within 12 months.